Dr. Franz Fischer, associate director of the Cologne Center for eHumanities, will be visiting the University from February 5 through 15 as part of the ongoing project in the Digital Schoolbook, a collaborative study of the history of educational materials and methods in the Latin West. He will participate in Prof. Bloomer’s graduate seminar in medieval Latin by offering a concentrated mini course introducing the theory and practice of digital text editing, including TEI. Please contact Prof. Bloomer, mbloomer@nd.edu, if you would like to attend this seminar. 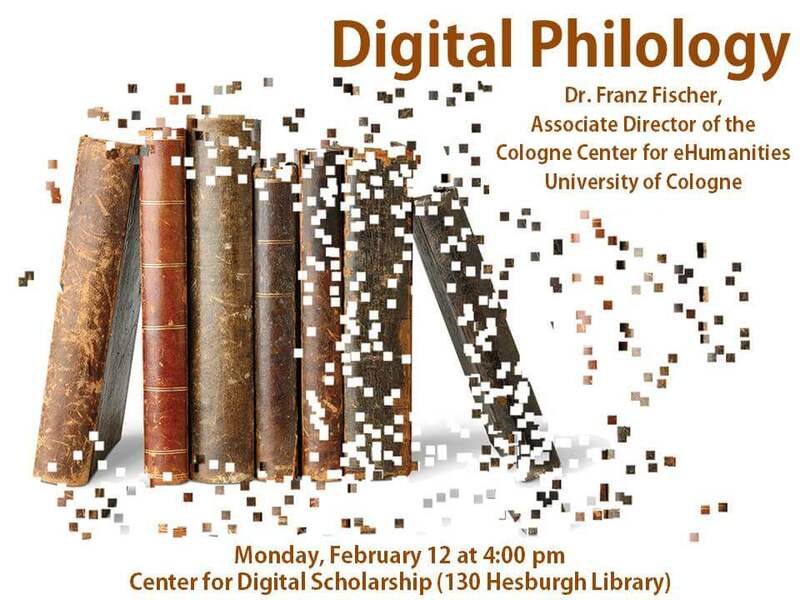 In addition, Dr. Fischer will give a public lecture on Digital Philology on Monday, February 12 at 4 p in the Hesburgh Library’s Center for Digital Scholarship. Originally published by Department of Classics at classics.nd.edu on February 02, 2018.